I have a very Christmas Threw Up In My House decorating aesthetic (it’s festive), and like any book lover worth my salt, I prefer to have books in, on, or around me at all times. The holidays are the perfect time to festoon your house with books. Most of these are DIY-able, although if you are the kind of person who can’t stand the desecration, EVEN WHEN IT’S LIKE AN OUT-OF-DATE SCIENCE TEXT OR SOMETHING THAT WOULD END UP PULPED ANYWAY, you should probably look away. Wrap your presents in old book pages if you want to be obvious and boring, ORRRRR tag presents with these amazing book monograms. As long as we’re making wreaths, get a pen and some watercolors to make this ridiculously beautiful one. If flowers ain’t your thing, this simple rolled paper wreath looks quick and fairly uncomplicated. Since it has less going on, try for a nicer book than an old James Patterson; this sheet music is lovely. If you have extra sheet music left over, dip some strips in glitter to make an adult (like…fancy. Not like adult) version of your classic elementary school Christmas chain. I’ve had these sparkly baubles pinned for as long as I’ve had Pinterest, so obviously I’m going to make them soon. This rolled paper ornament is like a miniature version of the wreath above. Plus acorn. These ones can be purchased on Etsy, though you could try your hand at them if you have nimbler fingers and sharper scissors than I do. These stars are also from Etsy, but if my elementary school memories are correct, sixth-graders are extremely good at folding and you probably have one near you willing to work for sugar cookies. SPEAKING of elementary school, everybody made one of these, right? Fold down a magazine, spray paint it green? 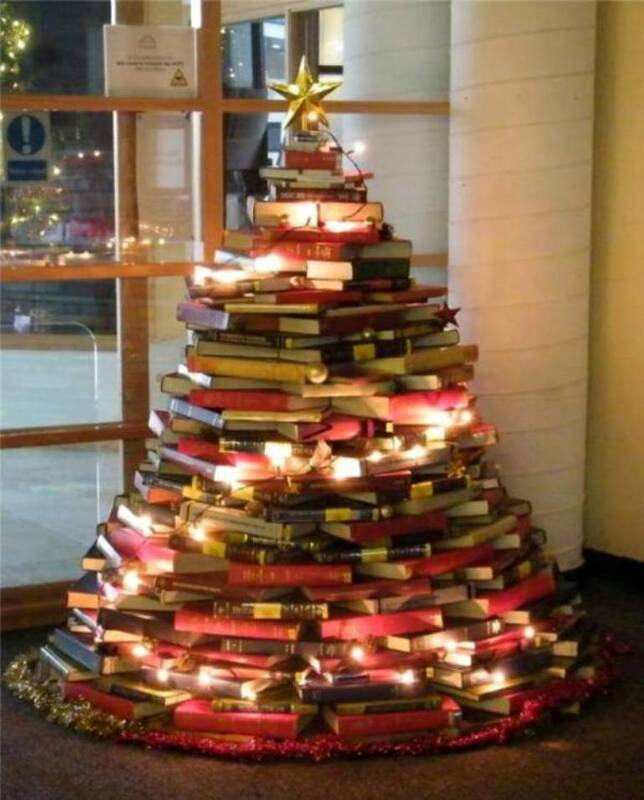 Or go all in and just make a whole entire tree out of whole entire books. For real. Errrrrvery body. It’s completely a thing now. Would you make any of these? How are you incorporating your love of books into the holidays?